In 1992, Paul Dorn sold his car, which wouldn't be such a big deal, except he never bought another one. Now he has written a book showing others how to get by with less car use or no car use at all. 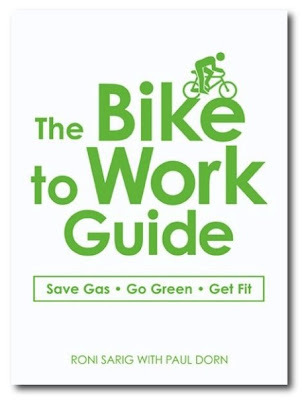 "The Bike to Work Guide: What You Need to Know to Save Gas, Go Green, Get Fit " (Adams Media, $7.95, 218 pages) focuses on helping the 57 million cyclists in the United States "extend the fun they have bicycling on weekends to their daily commute." "I didn't set out to become a bike commuting expert. I had a modest goal of creating a Web site, and that led me to have an ongoing conversation with bicyclists," said Dorn. Dorn is not a bike rider fixated on speed. He equips his touring-style bike with a rear rack. He usually rides wearing loose-fitting hiking shorts instead of tight-fitting Lycra. "People should ride whatever they are comfortable in and whatever suits their style," he said. Asked his position on helmets, which are not legally required for adults, Dorn says, "I'm not one of these helmet-enforcement types. I'm not a bicycling advocate who accentuates the danger. I accentuate the fun. Bicycling is safe. More people die in bathtubs every year than riding a bike." An overwhelming article in today's Sacramento Bee, by bicyclist and journalist Blair Anthony Robertson, with an impressive video by Andy Alfaro. I'm glad my comment about "the ongoing conversation with bicyclists" made it through the editing process. By means of this blog and my website, I've been privileged to have an extensive dialogue with bicyclists and would-be bicyclists from around the world. Everything I know about bicycle commuting is the product of the comments readers have sent to me or left on this blog, and I've learned a great deal from the bicyclists in San Francisco, Davis, and Sacramento. Let's hope this article encourages a few more folks to consider bicycle commuting. Image: Andy Alfaro, Sacramento Bee. Converting friends into recreational cyclists is fairly easy but encouraging the use of bikes for commuting, running errands, etc. is much harder. The list of excuses is quite long and varies with individual situations. The top two reasons are perceived safety and convenience. Having a train line to facilitate your commute is a great advantage. And yes "timid riding invites abuse". 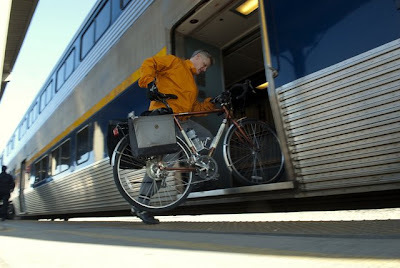 Wow, this is the first time i saw people bring bike in a train. I wish my place would have that kind of facility too. When Mr. Dorn crashes and cracks his bean open he will be a helmet wearing advocate. No, more people die from stupidity then from anything else. No thanks Mr. Dorn, I will wear my helmet and offer my opinion when asked. To kinda repeat an earlier contribution: The best thing you can say about helmets is they mitigate the consequences of a crash, they don't prevent a crash. I prefer to reduce crash potential by advocating for better road design (Complete Streets), increased numbers of cyclists, proper bike maintenance, and by encouraging people to improve their cycling skills. As Yehuda Moon suggests, the most dangerous thing on the streets are cars. That danger isn't reduced by making cyclists wear styrofoam hats. I always prefer to emphasize the fun of cycling, not the risks. Bicycling is not without risks, but it's not dangerous. There is also a disturbing tendency by some bicyclists to exaggerate the dangers of cycling to thereby exaggerate their moral virtue. "Bicycle commuting is dangerous, but I do it anyway because I'm courageous and good." Nonsense, bicycling is safe. Those are great positions Mr. Dorn but extremely idealistic in nature and somewhat unobtainable. Because you're courageous and good that will definitely keep you safe. How about because you use the right equipment: reflectors, lights, bright clothing, helmet, or rear-view mirror to name a few. Because our society doesn't value bicycle commuting and I am not certain this can be changed in our lifetimes. Cars are dangerous because people are careless. And a speed limit sign or any road designs are not going to stop cars from hitting cyclists. It's nice that you can justify your not wearing a helmet. But when you are put out there as an expert, advocate and adviser for bike commuting the responsibility now belongs to you. 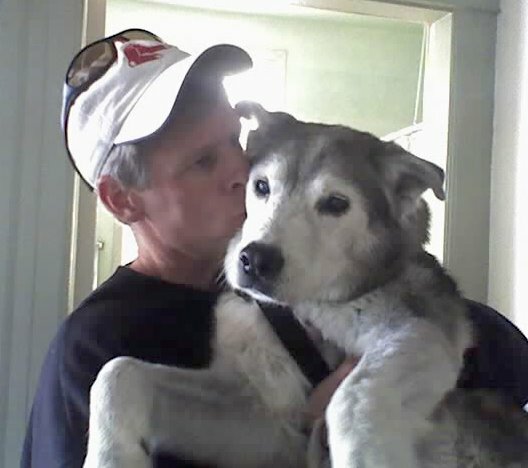 Hi Paul: You might be interested in learning that there is a bike ride over in Ione. It's being organized by Clark's Corner on Main St. on Sept. 18. Check out http://clarkscornerione.com/pages/cycling_challenge.cgi for more details. It's nice that you can bring your bike on the train. My local transit only allows bikes in off peak hours. But I use a folding bike so I can take it on anytime. I'd be interested to check out this book though. It's not like he's telling people NOT to wear helmets. I use my hybrid bike to commute to work and its great!